Bulbs are the sentinels of spring. We spend all winter in anxious anticipation of the rainbow of blooms that spring forth from those tiny little bulbs we plant in the fall. Bulbs should be planted now if you plan to enjoy them in spring. They need to go through the winter cold in the ground in order to bloom the following spring. In the world of bulbs, a little planning is required. Those that flower in spring need to be planted in the fall. Those that flower in late summer can be planted in early spring. 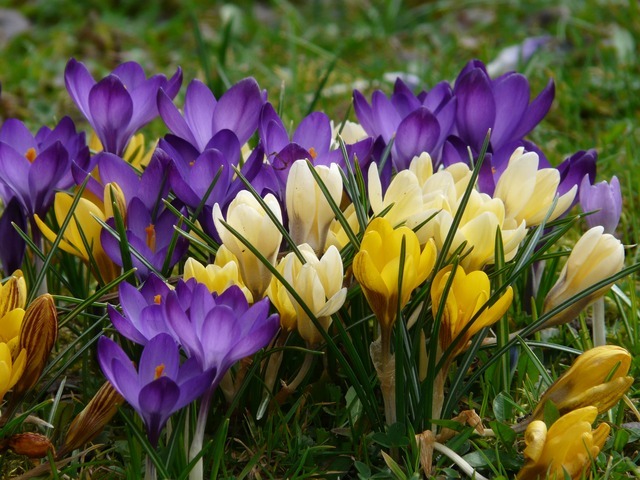 In the snowy month of March, you will see crocus peeking through the snow. Use them in borders of the garden, edging, in the grass, woodlands, and slopes or under trees. The colors range from white, yellow and striped to lavender and deep purple. These bulbs care little about spring snow and insist on flowering regardless of cold temperatures or severe weather. In addition to Crocus the Muscari, Anemone Blanda , and Galanthus bloom early. The most popular bulb is the Tulip. We have many different types of tulip bulbs. The tulip has varieties that bloom in March, April and May, depending on the type you choose. Darwin hybrids are well known for their dependable performance, year after year. 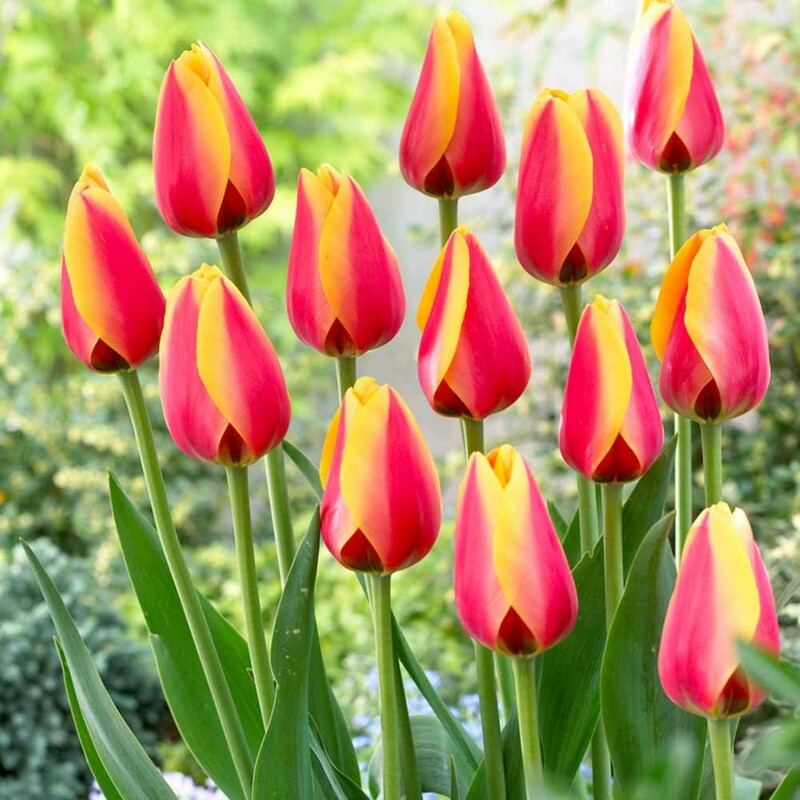 Tulips look best when planted in groupings of 5 or more bulbs. This will provide you with a patch of bright color that can be fit among existing perennials in the garden. Try planting in larger swaths of color where you might plant a border of annuals. Once the bulbs are done blooming, it will be time to plant your annuals. Your bedding plants will then disguise the bulb foliage while providing your summer garden color. Spring just wouldn’t be complete without the ever-dependable Daffodil. They just announce the word Spring with their everlasting beauty. 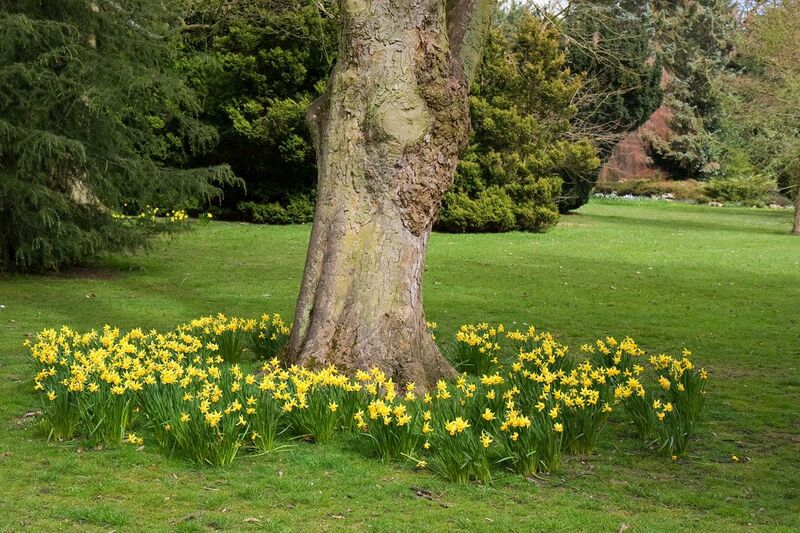 Daffodils are perfect for rock gardens, borders and beds. 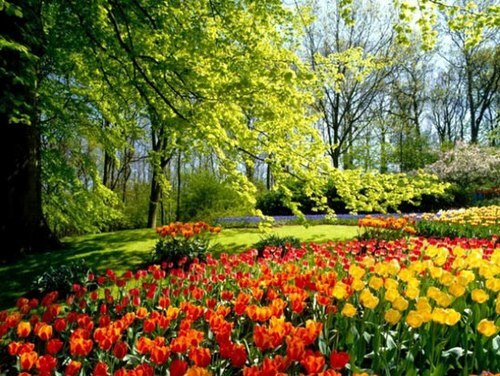 They are offered in a wide range of colors and shapes and are perfect plant for naturalizing. Daffodil ‘Golden Bells’ is new for 99. Also known as the Yellow Hoop Petticoat, it has as many as 15 stems per bulb. A group of 5 or so will form a carpet of dainty, upward facing bright golden bells in your garden next spring. It’s that time of year when the pesky pests come out to munch on our favorite garden plants. The warmer the weather, the faster those tiny eggs hatch. Before we know it, an army of aphids (or other pests) have decided to call our plants “home”. 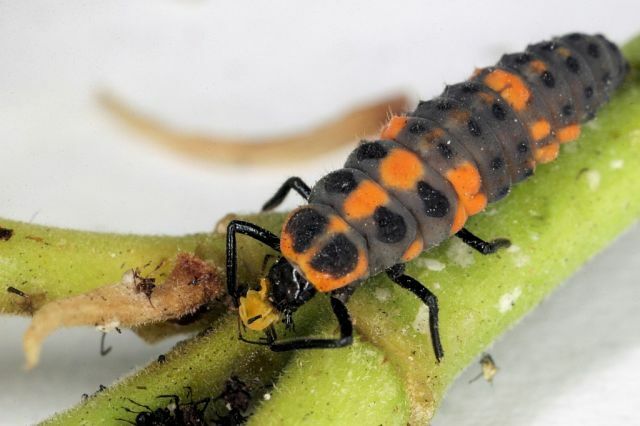 There are some things to know when determining how to manage pests in the yard. First, you’ll need to identify what you have in order to choose the best course of action. Some pests can be managed with a strong spray of water from hose, others may require an insecticide. Most insecticides target select pests. If you don’t know what you have, clip a small section of plant that is affected and put it in a sealed, clear plastic bag. Take the sample to your local garden center or county extension office for identification. 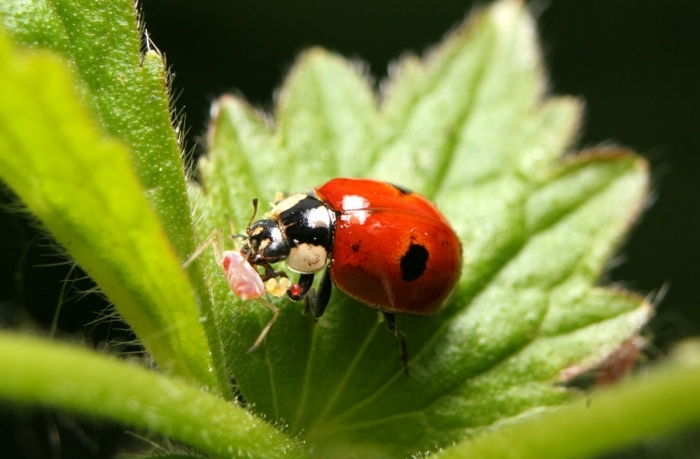 The most common pests are aphids, spider mites, white fly, Japanese beetles, earwigs, scale, and slugs. There are a plethora of other insects, like tomato horn worm, psyllids, flea beetles and geranium bud worm, too. Many will be managed by Mother Nature’s predatory insects. 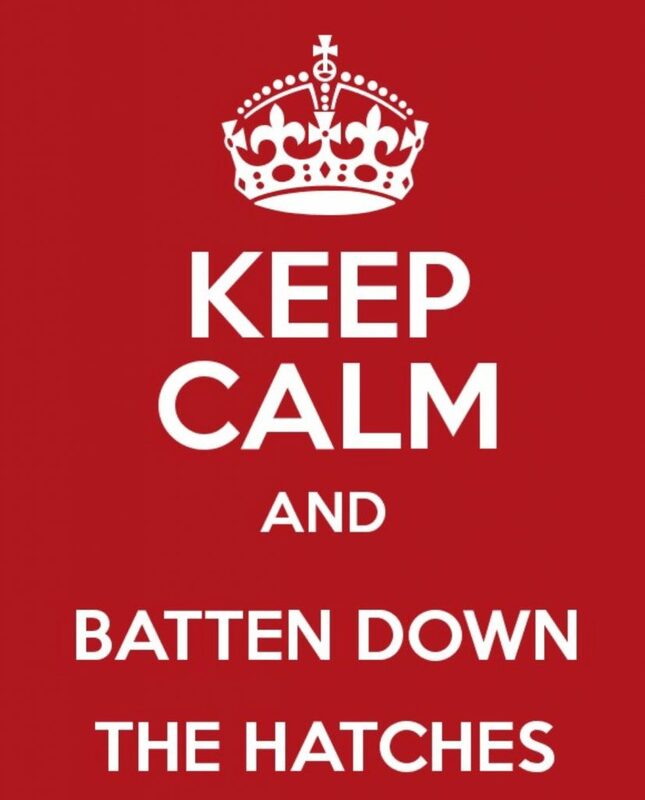 Others, however, may require a bit of direct attention. 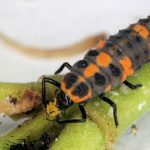 Aphids are probably the most common garden pest. They are usually green, but may be black or red, or even woolly. Aphids are pretty easy to identify. You’ll be able to see adults with their distinctive horn-like spikes over their back legs. 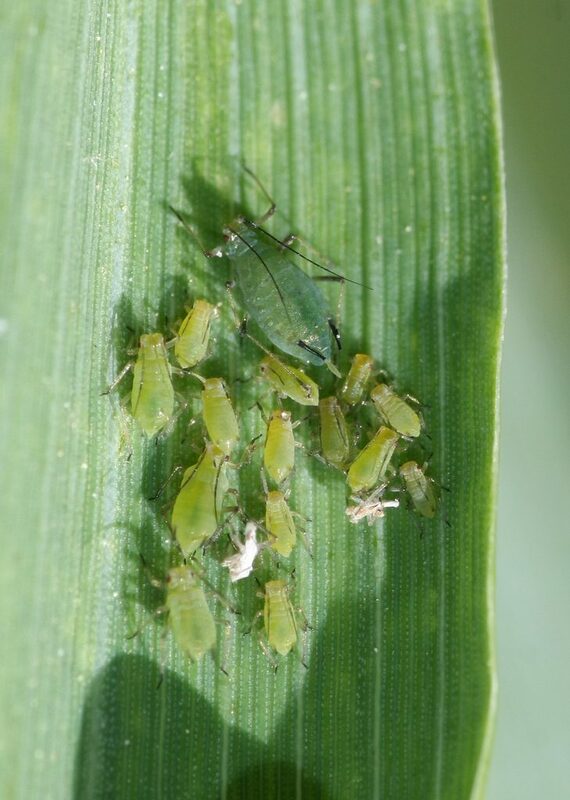 Aphids are pretty easy to manage. If it is a light infestation, like the one pictured above, a hard stream of water will knock them off, pretty easily. Ladybugs love to munch on aphids. Release them in the cool evening hours and they’ll be making mince meat out of those aphids in no time. 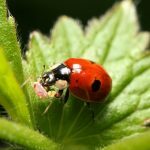 Your ladybugs will stay in the area as long as they have a food supply. 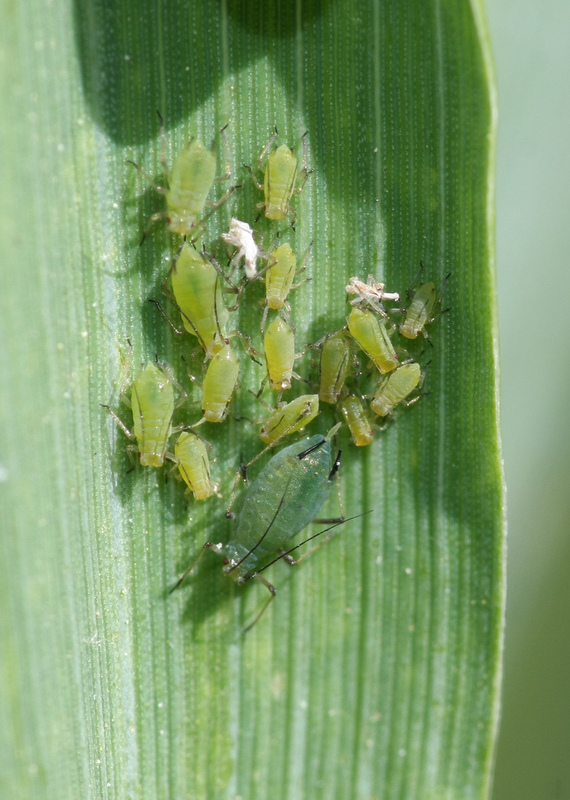 Once your aphids are under control, they are likely to move on to another food source. They can also be controlled using Neem oil or pyrethrin sprays. Both are safe and effective, natural products. Avoid applying any chemicals on hot sunny days. Apply them in the morning or evening, to avoid damage to foliage. These tiny little creatures usually go without notice until we see their telltale webs. For the most part, they hand out on the back of leaves, sucking the life out of our plants. They are a little smaller than a pin head, making them difficult to see with the naked eye. If you hold a piece of paper under an infested leaf and tap the leaf, some will fall onto the paper, making them easier to see. 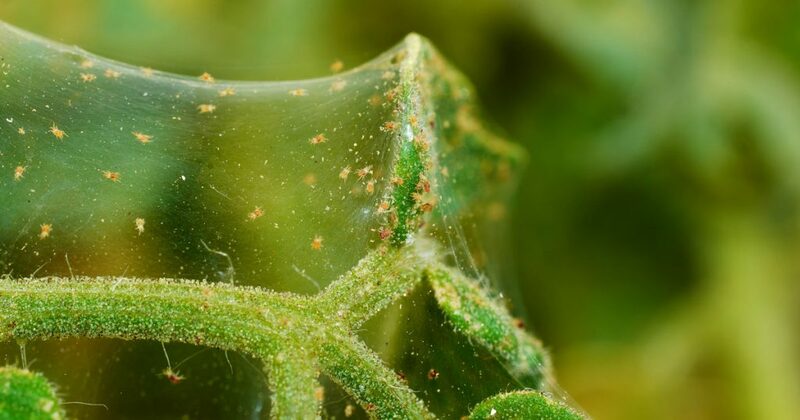 Spider mites aren’t fond of moisture. Direct water spray from a hose nozzle will usually knock them off. That said, they are persistent little buggers. Spraying them with a pyrethrin spray, or Neem oil would be prudent. As with any chemical that is not a systemic, you’ll want to spray ever 5-7 days for 2-3 weeks, in order to catch each life cycle. 1. Watch- Plants will often tell you when they are needing water. 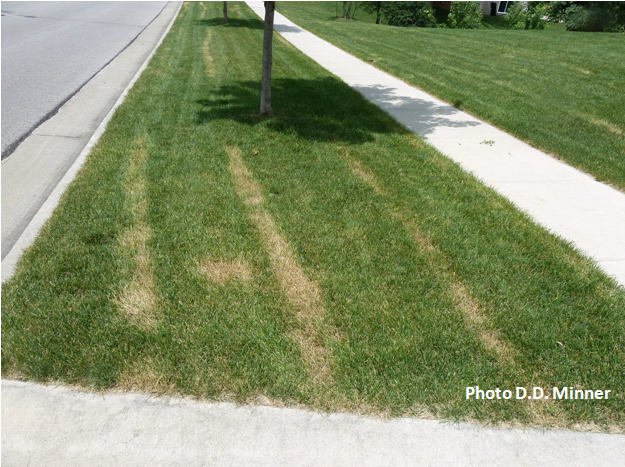 Lawns will turn a bluish green and show footprints that don’t rebound. Bean leaves will turn a darker green and begin to wilt. Most plants will perform better if you don’t allow them to wilt before watering, so check your garden every day and observe their needs. 2. 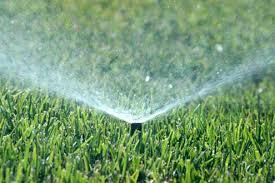 Water- It’s true that you need to water more often during hot weather, but first check the soil. The surface may look dry even though there is plenty of moisture in the root zone. Over-watering can be just as harmful as under-watering, so don’t over do it. Slow, deep watering will insure that water soaks down to the roots. Soaker hoses and drip irrigation systems work well. If using a hose that has been laying in the sun, be sure to let it run for a minute or two, until cool water comes out. 3. Mulch- A couple of inches of organic mulch like compost, grass clippings, or bark mulch will help reduce moisture loss and cool the soil temperature. A side benefit is that it prevents most weeds from germinating, too. 4. Shade- Cover cool weather veggies like lettuce and spinach with shade cloth. It won’t totally prevent bolting, but it could delay it a bit. Also, raise your lawn mower blade up so that you have 3 inches of grass left standing after you mow. This will provide shade for the roots of your lawn keeping them cool and much happier (which means a greener lawn). The calendar says spring, but the weather isn’t quite ideal for most garden veggies and annuals. While planting seeds indoors for later transplant is fun, it’s not exactly scratching our itch to plant in the garden. So what can we plant? Asparagus, Chives, Fennel, Garlic, Onions, Peas, Potatoes, Radishes, Strawberries are the earliest veggies to plant. We’ll focus on 3 of the most popular early vegetables – peas, asparagus and strawberries. 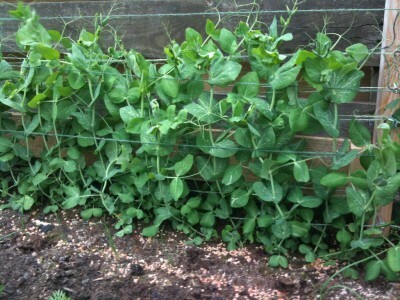 Peas are among the easiest vegetables to grow. It’s a great choice for beginning gardeners of all ages. They can usually be planted around the first week of April. Here are a few tips. 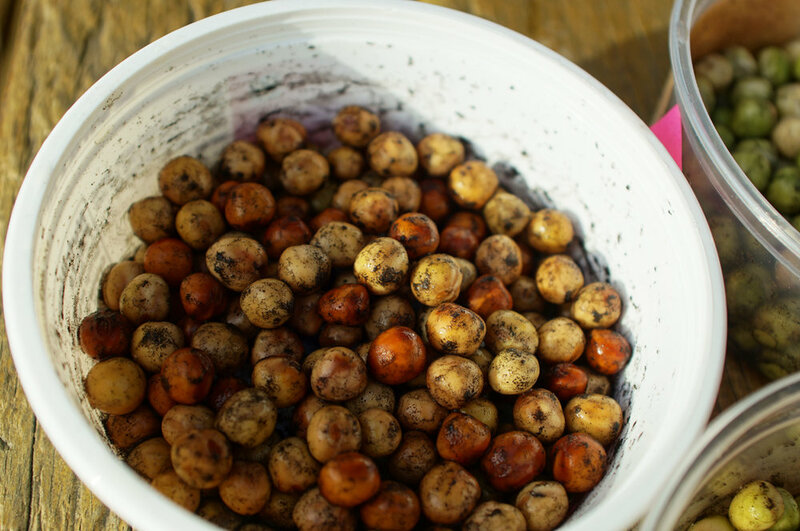 Dampen the seeds and cover them with inoculant for legumes before planting, then plant. Peas and other legumes benefit from inoculation, which adds bacteria to the host plant seed prior to planting. The bacterium attaches to the root system and creates a symbiotic relationship with legumes, making it easy for your peas to obtain and use nitrogen. Asparagus takes a little effort and time, but the reward is oh, so tasty. ‘Martha Washington’ is one of the most popular varieties. 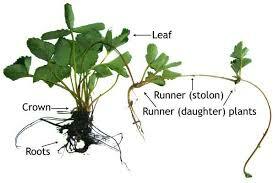 However it produces both male and female plants. Female plants produce attractive red berries in the fall, but fewer edible spears. ‘Jersey Giant’ is a contemporary hybrid of all-male plants, which is more productive and has greater disease resistance. ‘Purple Passion’ produces purple spears which dress up the dinner plate and often entice children to eat their veggies. It’s best to wait a year after planting asparagus, before making a harvest. 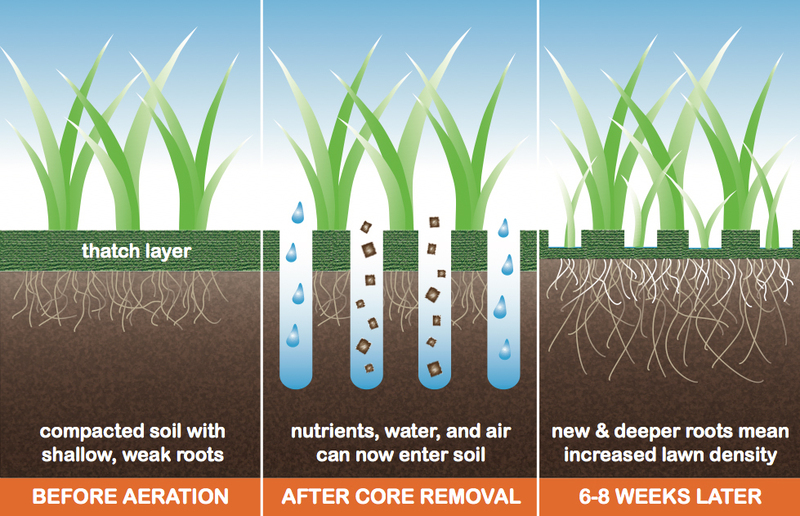 This allows the plants to develop a healthy root system. In the second season, harvest spears larger than a pencil. The third season, and thereafter, harvest as you choose. Allowing the plants three seasons to fully establish themselves insures a long lived patch for years to come. Strawberries are another popular perennial edible. It’s best to provide a separate planting area for them, outside your normal vegetable beds, because plants spread rapidly. 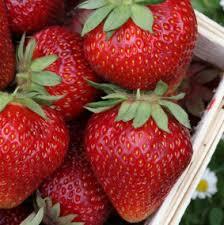 There are 3 types of strawberries: June bearing, Everbearing and Day Neutral. We skip the June bearing plants because we want strawberries more than just one month each year. Everbearing strawberries provide two crops of strawberries, making them ideal for canning and freezing. Fort Laramie, Quinalt and Ozark Beauty are some of our favorites. Day Neutral strawberries produce fruit from spring to fall, making them a great choice for enjoying fresh from the garden throughout the summer. Our favorite is Eversweet, with its large, deliciously sweet flavor. It’s also the best choice for container growing since it doesn’t require pinching of runners or flowers to establish. 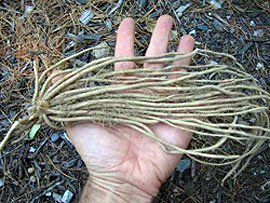 While we offer strawberry transplants in packs, you may find it easier to start from dormant bare root stock. When planted in early spring, once night temperatures are consistently above 25°F, they establish quickly. Be sure to stay on top of weeding around your strawberries. An ounce of prevention goes a long way when it comes to the strawberry patch. Mulch will help keeps weeds in check, making it a little easier on your knees. When it comes to June bearing and Everbearing varieties, it’s a good idea to remove the flowers and runners for the first season in favor of growing a healthy root system. We know it’s a lot to ask, but a little self-control now will provide you with a bigger harvest the second season. Container grown strawberries won’t over-winter here, so there’s no need to pinch off flowers or runners. To get started, amend the planting area with compost. 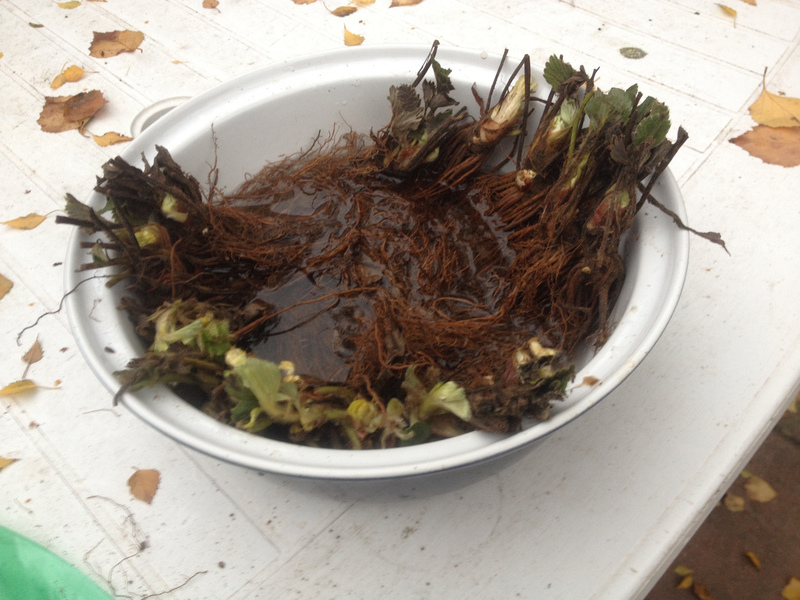 Soak your strawberry roots for about half an hour, to rehydrate them, before planting. Plant them so that the soil level is level with the crown of the plant. 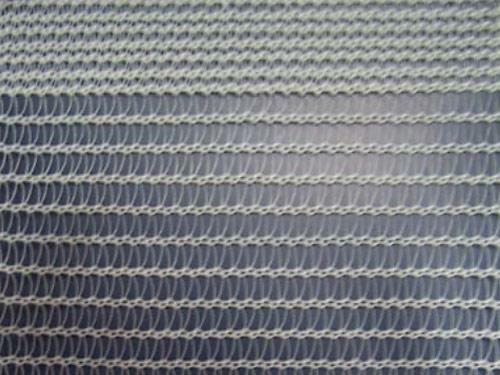 Be ready to cover with netting to keep birds and small animals from snatching your strawberries as they grow. Drip irrigation is the best way to water strawberries. If you water overhead, do it in the morning. This will allow the fruit and foliage to dry before nightfall, reducing the risk of disease affecting your plants. 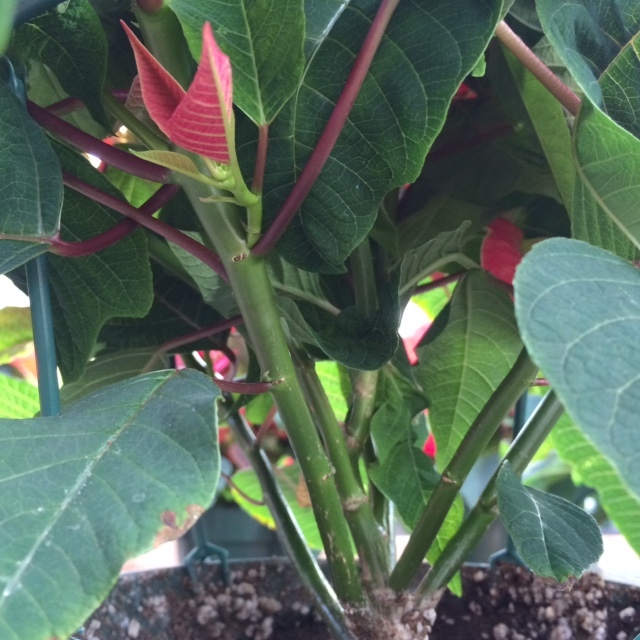 Peterstar Marble Poinsettia with tightly budded flowers framed by the colorful bracts of foliage. Millions of poinsettias are purchased each year during the Christmas season by people who enjoy the color and warmth they provide to their home. Healthy plants will last throughout the holiday season. How do you choose the perfect poinsettia? 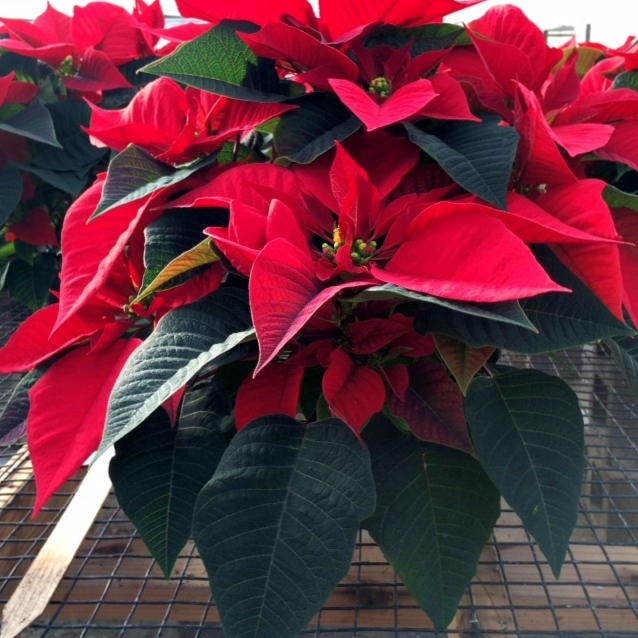 Poinsettia plants should be stocky with dark green foliage, well-formed richly colored bracts (modified leaves) and very few open flowers (golden-yellow clusters located at the center of the bracts.) Proper selection will help to insure a long lasting plant that you will enjoy throughout the holiday season. Sturdy branches filled with deep green leaves indicate a healthy plant. 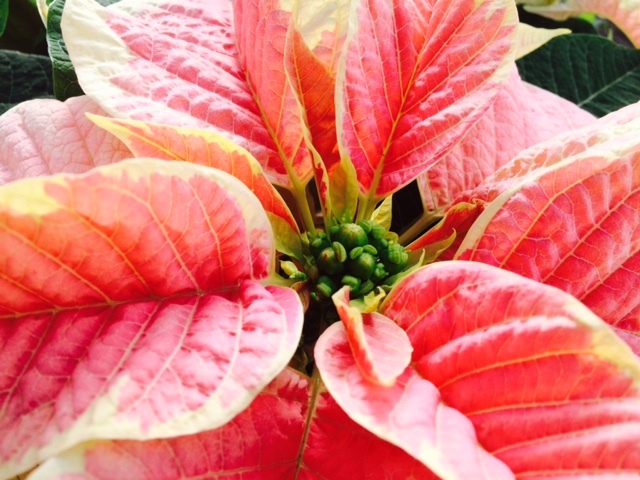 Healthy poinsettias have lush leaves and bright colors. There are few tricks to get your poinsettia home safely. If temperatures are below 50° F, the plant must be sleeved to protect the plant as it leaves the warmth of the garden center. Avoid exposing poinsettias to cold temperatures. A chilled plant will begin to drop leaves very quickly. Once inside, remove the protective wrapping. It is often easier to carefully slit the side of the sleeve to remove it. Because poinsettia bracts are a little sticky and can adhere to plant sleeves, pulling them down will result in branches breaking. Don’t leave them wrapped for more than the time it takes to get your plant home. Leaving them covered can result in blackening, curling and overall plant distress. If you plan to give the plant as a gift at a later time, ask for a second plant sleeve to use when you transport it to its final destination. Contrary to popular belief, the Poinsettia is not likely to harm your pets or your children. Research at Ohio State University, working with The Society of American Florists, has proven that no toxicity was evident at experimental levels that would well exceed the amounts likely to be ingested in the home environment. Were a person to consume a great many leaves, the result would likely be mild stomach upset. 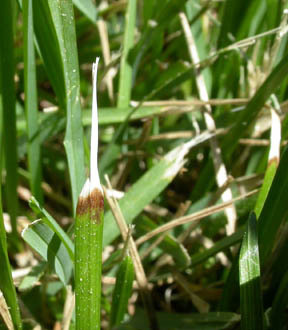 The white sap can cause skin irritation which can be remedied by washing with soap and water. 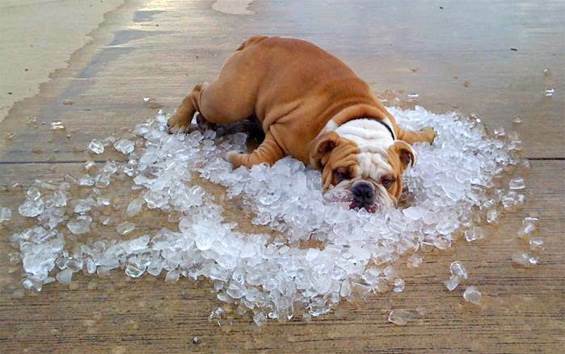 • TEMPERATURE: A cool room (65-70F during the day and 60-65F at night) is ideal. Avoid hot or cold drafts or excess heat from appliances, fireplaces, radiators or ventilating ducts. • LIGHT: Very bright, indirect light is essential for proper growth and color retention. • WATER: Plants should be checked daily and watered thoroughly whenever the soil feels dry to touch or the pot becomes light. If the plant is wrapped in foil, slit the bottom to avoid water accumulating at the bottom of the pot. If it is in a basket, be sure to discard any drainage that collects. Poinsettias hate to have their pots standing in water and they aren’t very forgiving about it. • FERTILIZER: Plants should be fertilized with a well-balanced all purpose fertilizer like Peter’s 20-20-20 until the poinsettia is in full color. 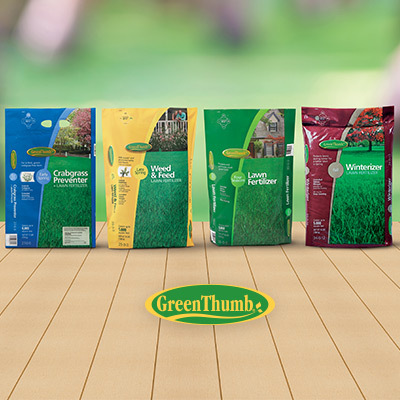 Once in full color, reduce fertilizing to ½ strength once every 3-4 times that you water. 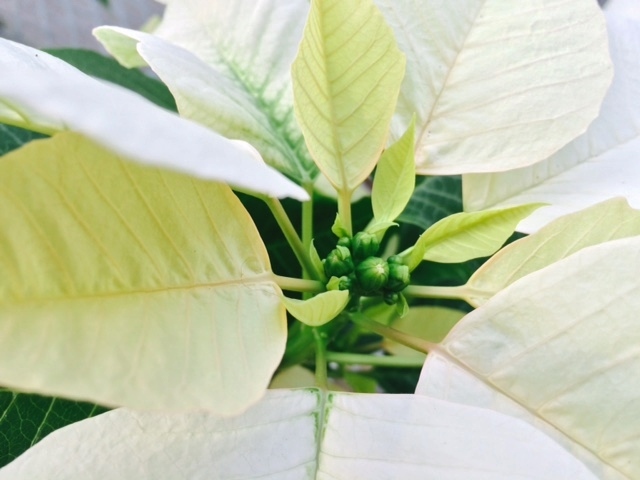 If you have a gardener’s green thumb, you may want to try your hand at reflowering your poinsettia next year. If you follow these directions very carefully, it is possible to have your poinsettia in flower by Christmas. The following describes the cycle of poinsettia color. • December: Full bloom. Water as needed. • Late March to Early April: Color fades. Keep near a sunny window. Cut stems back to about 8”. Water as needed and fertilize with a well-balanced, all purpose fertilizer like Peter’s All-Purpose Plant Food. Around May you should see new growth. • June 1st: Re-pot if necessary in a well-drained potting mix. You can put your plant outside if you would like as long as the night temperatures are consistently above 55 F and it is protected from the hot sun. • July-August: Pruning may be required to keep your plant compact and bushy. Do not prune after September 1st. • Starting October 1st: Provide complete and continuous darkness for 12-14 hours night combined with 6-8 hours of bright light a day. During the night, stray light of any kind, streetlights or household lamps, may delay or halt the re-flowering process. • Remember: The key to success is to follow the strict light-dark requirements very carefully. • Once your poinsettia is in full color, stop fertilizing until it loses its color and the cycle starts again in March. 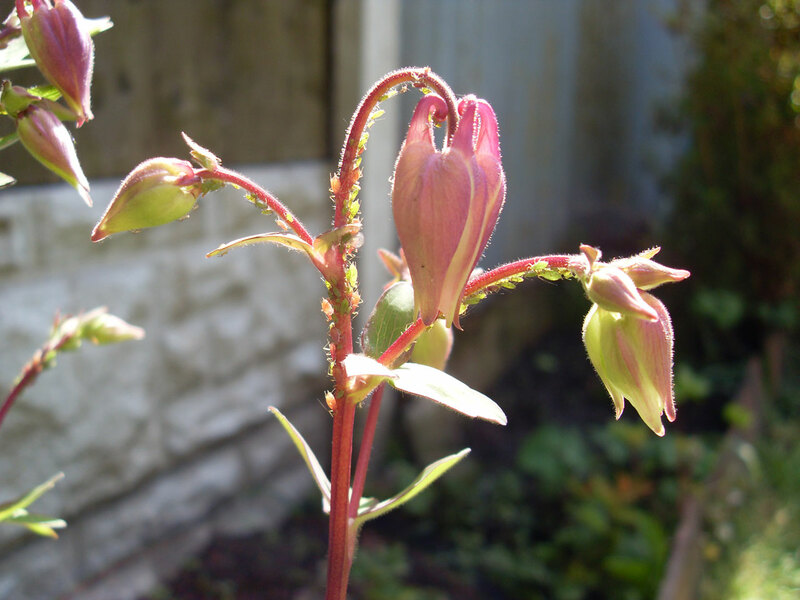 The assigned botanical name is Euphorbia pulcherrima, meaning “the most beautiful Euphorbia”. The United States’ first ambassador to Mexico, Joel Robert Poinsett, sent several plants back to his home in Greenville, South Carolina in 1825. The common name, poinsettia, comes from his last name. • Do a general clean-up of the area and remove the damaged parts of plants – trim off any hanging stems and remove the debris in the area. • If all that remains are stems, trim them back by half and they will possibly releaf. • Lightly cultivate the soil around the damaged plants. The force of hail and heavy rain compacts the soil and leaves a hard crusty layer at the surface – gently cultivate to break up the crusty layer. • Avoid the urge to immediately fertilize the damaged plants. Give them a chance to develop new growth. After a week to 2 weeks fertilize with fish emulsion or seaweed extract. After they have resumed active growth, regular fertilization can resume. 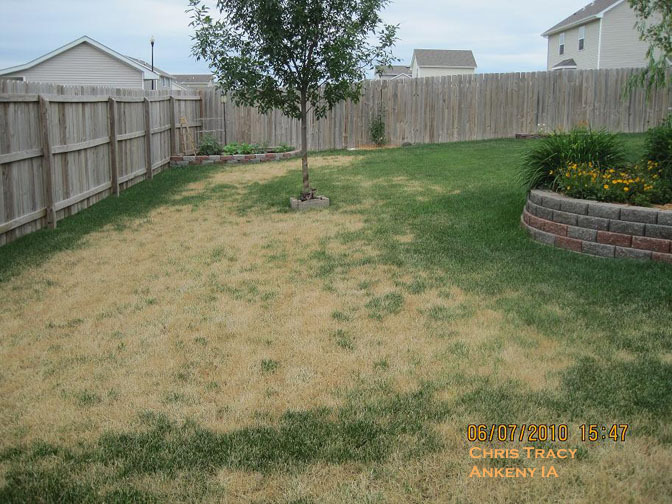 In many instances, hail damage is a Mother Nature “pruning” of the plant. Remember that pruning stimulates growth, and many plants can recover. There will be those that are beyond repair and will have to be replaced. There are many ways to protect plants from hail to come. Invert cardboard boxes, buckets or pots, over your plants. Hail netting is a great way to protect plants. Use stakes to hold it above the foliage of your plants. It’s durable and lasts for years. Because it allows water and sunlight to pass through the netting, it can be left over plant for a time, safely.